Wrapping a bridal shower gift isn't as easy when the gift is large. Sometimes the perfect gift for a bridal shower is one that seems impossible to wrap. Something like a table lamp, hat tree or ironing board that is large and of a difficult shape will not fit into a traditional bridal shower gift bag. Attempting to wrap large gifts with wrapping paper may seem like a waste and will be difficult to do well if the gift is not in a box. Wrapping large gifts requires some creativity and a willingness to use alternative materials and methods. Wrap the gift loosely in many sheets of tissue paper. Although tissue paper is prone to tearing, it is much easier to manipulate than heavy wrapping paper when wrapping delicate parts such as a lampshade. In addition, tissue paper is inexpensive, so you can go through a whole package without spending much. Wrap the large gift in white tulle. Although you will be able to see through the tulle, it is a familiar bridal material and will fit in well at a bridal shower. Using many layers of tulle or wrapping the gift loosely in tissue paper and then in tulle will help make the present a surprise. Tulle is an ideal gift-wrap material because it is inexpensive and is very strong. Put the gift in a large bag. Although gift bags may not be large enough, there are many other types of bags that will work as gift-wrapping material. Colored plastic shopping bags or simple white trash bags can conceal the gift and serve as a canvas for further embellishments. Another option is to purchase or sew a large fabric bag to hold the gift. Tie an elegant ribbon around the gift. 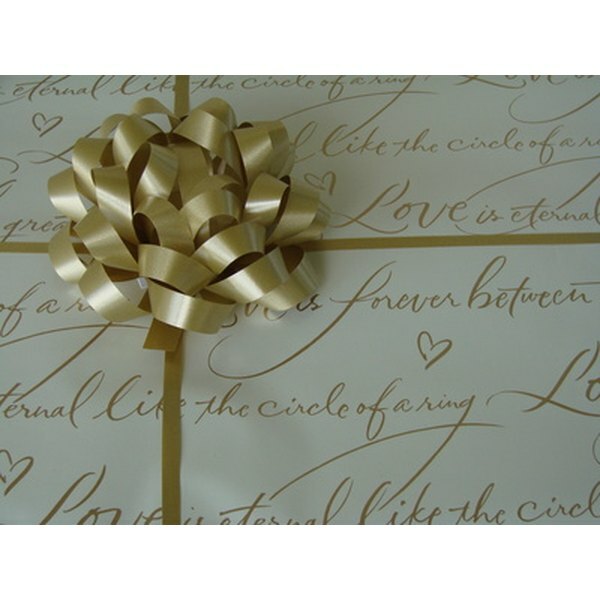 Even if the gift-wrap material is not luxurious, a beautiful ribbon will divert attention away from the wrapping. Velvet ribbon, shimmer ribbon or ribbon in the bride's colors could be used as the focal point of the gift. Include something special in the ribbon. A creative idea for a kitchen-related gift is to put a kitchen utensil in the bow. For example, wrap ribbon around and through a pair of salad tongs to make a bow-shaped decoration. Incorporate fresh or silk flowers into the gift wrapping. Use one large flower, such as a hydrangea, as a focal point, or just attach a row of daisies to the ribbon.